ball-and-stick model of DNA, molecular models & crystal lattices models in chemistry eduacation. Using b&s molecular & crystal lattices models in chemistry education. Molecular models kits. B&S DNA model. European Variety in Chemistry Education 2005. Abstract. Edukacja Sp. z o.o., Mikołów, Poland was founded in 1995. Teaching aids was the first articles we were offered at that time. Today on our Web Site www.edukacja-mikolow.pl or www.edukacja-mikolow.com you can find near thousand articles for school. Among then you can find teaching aids, school furniture, blackboards, overhead projectors, school labs and so on. All of them you can find on our Web Site. See you on www.edukacja-mikolow.pl is our pleasance. 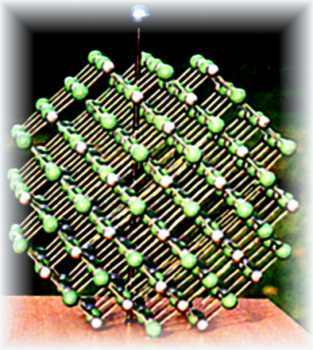 M&C Lab ball-and-stick molecular and crystal lattices models suit especially well for the demonstrations the general aspects of space relationships building of matter. The simple and intuitive analogy to real object makes it very usefull for every level of chemistry education. The basic ideas for constructing ball-and-stick molecular models are just from VSEPR theory. Metal rods and plastic tubes represents chemical bonds. Plastic ball with properly distributed rods can represent "atom in molecule" according to Pauling's suggestions. Some of these models are present below and some of them you can find on Web Site www.edukacja-mikolow.pl (please click M&C Lab Molecular Models). On the Web Site there are 3D representation to compare selected small molecules models: space filling vs ball-and-stick vs skeletal. Let's take a brief of some basic M&C Lab models and kits of structural elements for molecular modeling. The DNA model is assembled using ball-and-stick elements. The helix z-direction length 54 or 81cm. Models are mounted on wooden plate 40x40cm. Structural elements set for molecular modeling. - 675 plastic tubes of different length which are use as connectors for balls to create chemical bonding. The manual on CD with 3D animation is attached. The examples of crystal lattices models - ice, halite - and model of fullerene are presented below. The models are mounted on wooden plate of 40x40cm for crystal lattices and 30x30cm for fullerene. These models, like DNA models, are assembled. If you can imagine the rods connecting atoms together not as chemical bonds, but rather as direction in enviromental space where chemical bonds are forming, you can find these models very useful for today.